Hi! I really want to try and get better at posting some of my work week and weekend outfits in addition to daily posting on Instagram. Here’s some of my favorite outfits from October. We spent a week on vacation so most of the outfits are from the past few weeks and the weather has gone from being mild to downright chilly! While I still love my colors, I am still finding myself leaning towards a more neutral palette and burgundy is still a favorite fall color for me. First up, some Halloween colors and layers. Yes, it was cold enough for a winter coat this week. I bought this sweater last year but am still seeing the style around at various retailers this year and I hadn’t thought of styling it with dress pants until I saw some styling ideas at Banana Republic. Plus, with my new properly fitting bras, the ribbing in the sweater didn’t make me look huge in the chest area. I still felt like the sweater and pants was missing something so I added a suiting vest and the loafers finished off the menswear inspired look. 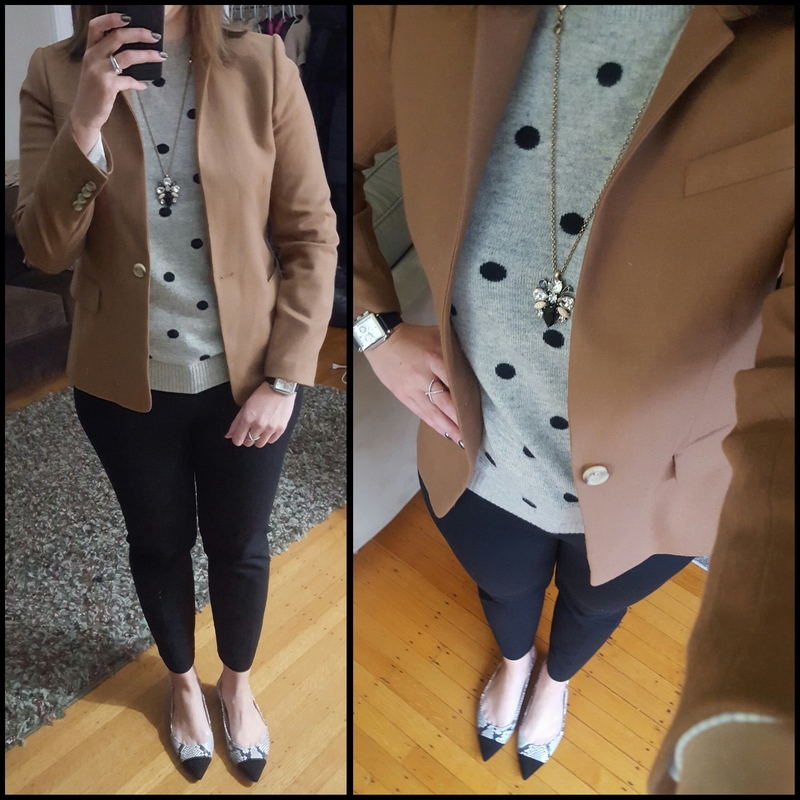 Next up is a neutral inspired outfit featuring one of my favorite fall purchases – the J.Crew Regent Blazer. I had been looking for a camel blazer, as the one I owned before was not the right shade for me. I love the shape of this blazer and while the collar is designed to wear standing up, you can still fold it down. I actually started with the shoes on this outfit and build the outfit from there. 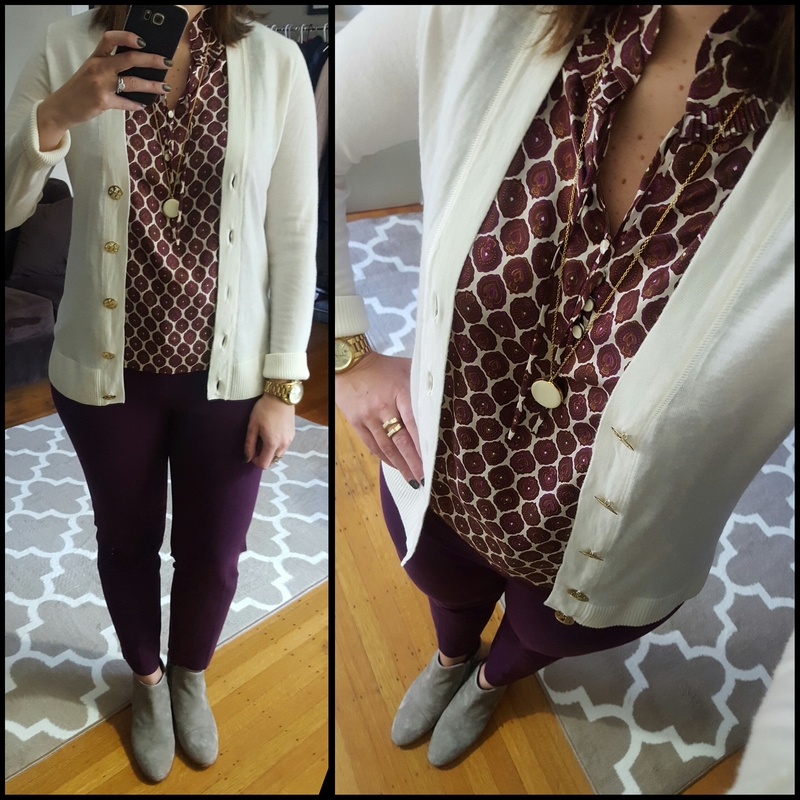 A grey sweater with polka dots was a little more interesting than a plain grey sweater and the shoes and necklace pulled it all together. When in doubt, my go to pants are the Banana Republic Sloan pants. They’re comfortable, slim fit but still professional enough for work. Next up is a monochrome look I wore to work on Friday for an all day division meeting we had. I wanted to be polished and put together with a little flair via the necklace and gold buttons on the jacket but still stay in muted colors. 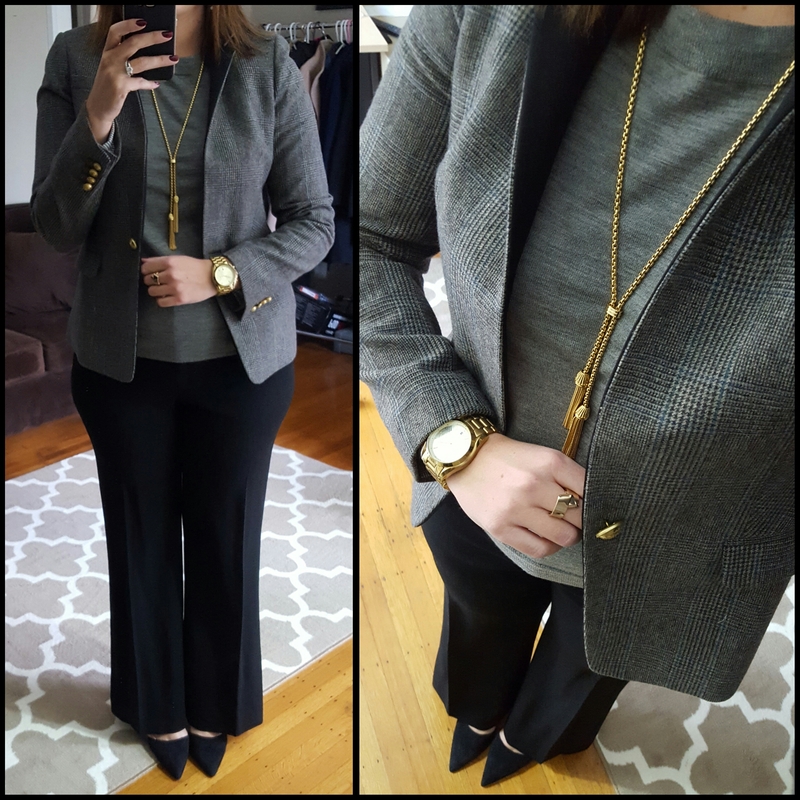 This is another Regent Blazer from J.Crew but an older one from last year. I paired it with a grey sweater underneath, wider leg full length pants and suede heels. 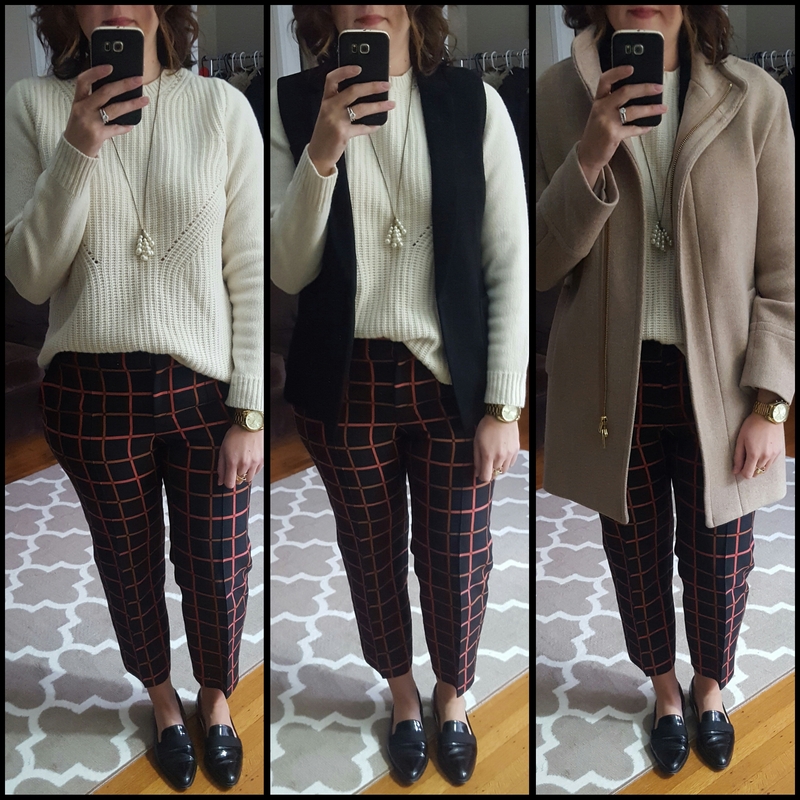 While I love wearing ankle length slimmer pants I also like pulling out the full length pants now and then especially when it’s a little colder out. I might usually pick silver to pair with grey since they’re similar tones but with the gold buttons I went with gold jewelry. Last up, a few outfits featuring my go to Sam Edelman booties this season. I received these as a gift last Christmas and am just pulling them out this fall for the first time. I want them in every color! They are incredibly comfortable and are great with jeans on the weekend or for a business casual work look. Since I’m sharing work looks, I’ll stick with how I’ve styled these for work. My blouse is an older J.Crew piece that I found recently via a J.Crew swap/sale and I admittedly have only worn it a few times because I have trouble styling it. Coincidentally, I also have trouble pairing this Tory Burch cardigan for some reason. I think because it’s a on the sheer side you can only pair it well with sleeveless blouses but I started with the blouse and matching pants and then tried the ivory cardigan, necklace and finished up with the booties. 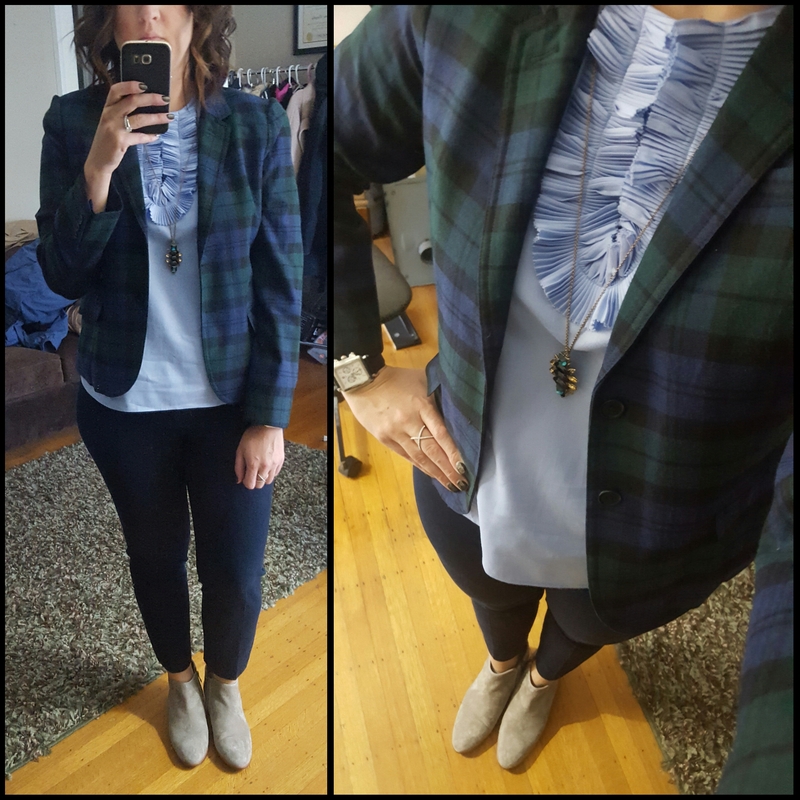 This oxford blue top was a recent purchase and I love how it pairs with a navy or darker plaid blazer. I like that the pleated collar on this blouse stays put and it’s a fun way to dress up a suit if I were going to wear it with a more formal suit. Once again, I’ve paired the top and blazer with a pair of Banana Republic Sloan Pants. Hopefully you liked seeing a snippet of my recent work outfits. I would love to hear what you think of them and thanks for visiting! Love that you do a round up. It’s so helpful. I’m going to use it to plan my next week’s outfits. Thanks.